When considering where in your house to install smoke detectors, consider two things. One, where the highest risk of fire outbreak exists. Two, where family members spend the most time. Some of these will not share these two traits, like a furnace room and a bedroom, while other rooms in the house will meet both criteria, like the kitchen or living room with a fireplace. When considering the high-risk areas in your home, they will include furnace rooms, laundry rooms, kitchens, and any room with a fireplace like a living room, family room, and even a master bedroom. When thinking about where the members in your household spend the bulk of their time, those areas will include bedrooms, family or living rooms, and the kitchen and dining rooms. These are your top priorities when deciding where to place the smoke detectors, and how many detectors you will need to install. Other home security tips to keep in mind when it comes to smoke detectors deal with optimal performance. Placing a smoke detector on a ceiling is not necessarily the best placement. Smoke can dissipate substantially by the time it reaches the ceiling and a smoke detector might not sound the alarm. The best location is high on a wall. Smoke will travel up a wall, and this placement will result in the earliest notification possible of a fire in your house. Be certain to not install a smoke detector near a cold air return, an air conditioner, a ceiling fan, or an open window. These can serve to cause the smoke to never reach the detector, thereby delaying notification that the house is on fire and the family is in danger. Finally, monthly and semi-annual maintenance will extend the life of each detector and will create the best conditions possible for effective functionality. On a monthly basis it's important to dust the fins that allow the smoke to enter into the detector. Keeping these free from debris will ensure peak performance. Every six months the batteries in each detector needs to be replaced. Setting an easy-to-remember day, like the first day of spring and the first day of fall, will ensure that your smoke detectors are operating at their highest capacity. Make smoke detectors part of your monitored ADT monitored security system and protected your family against potentially deadly house fires and smoke inhalation. How many times have you told your children to never answer the door, or to always ask who it is before opening the door? If you're anything at all like me when it comes to parenting, then it's countless times. After all, it is great advice and will serve them well throughout their lives. On the flip side, how many times have you answered the door without giving this advice a second thought? Again, if you're like me then it's countless times. Until recently I realized I wasn't heeding my own advice. It was starting to make me feel like I was one of those "do as I say, not as I do" parents, and that's definitely not the message I want to be sending to my children, particularly when it comes to anything involving home security tips. Skilled burglars will disguise themselves as deliverymen, repairmen, bill collectors, survey takers, and just about anything else that will cause people to open their front doors without so much as a hesitation. I did not want that for my family, so a couple of months ago I decided I was going to make a conscious effort to change my door-answering habits. I decided it would be a two-step process for me, after I'd decided it would be a one step process. Let me explain. Our front door was not equipped with a peephole, so I figured it was time to install one. I didn't know why I had it in my mind that this was some kind of involved process that might take someone with a handier set of skills to install, but that was my initial thought about installing one. I'm actually embarrassed to admit that it was very simple. Essentially this: drill a hole, install the peephole. Anyone ever say to you that if they can do it anyone can? Trust me when I tell you that. It was simple and I was super pleased after the work was done. It didn't take too many knocks on the door before I realized my smaller children couldn't see through the peephole. That's when I decided it was time to turn to some modern technology. A wireless camera above the front door of our house was exactly that ticket. Again, the installation was simpler than I thought, not to mention I'd had my confidence boosted when I installed the peephole a couple of weeks earlier. Because I was already using a monitored ADT monitored security system, the addition of a wireless camera above my door was a snap. The way it works is pretty awesome. I can see who's at the door from any web-enabled computer, PDA, or cell phone, or any TV or other monitor in my house, or even a dedicated monitor. We're a modern family and have enough computer and other web-enabled devices around our house, which in turn made this option totally feasible. Now we know who's at our front door without having to ask, and everyone in the house has gotten in the habit of checking a monitor before answering the door, me included. Trust your home security to a monitored ADT home security system and discover the true peace of mind that comes with doing everything you can to protect your family. I decided a couple of weeks ago that I was going to put two lamps in my house on timers so that they'd turn on and off at certain times of the night and early morning. I have a large home and there's one section I don't go into very often, primarily because I've consolidated my living conditions to the other side of the house. My goal was to simulate the presence of someone else in my house, which is a very good way to deter wannabe burglars and generally increase your home security. Here's how I did it. First, I put together a plan that I felt would simulate the habits of an older person—like a parent—and a younger person—perhaps a younger child. Decided to use two lamps in adjoining rooms. The first thing to simulate was what might actually transpire each night before bedtime. So I set both lamps to come on mid-evening, with one shutting off about an hour before the other. I decided this would look like a child going to bed, and sometime later the parent retiring for the night. The next time the lamps come on is around 1:00am. I have set the lamp that shut off first to come one, figuring a young child might get up at night to use the restroom or even go into his parent's room. One minute later I have the other lamp turning on. They are only on for a couple of minutes each, and essentially shut off at the same time. The third time they come on is in the morning. I have the lamp in the "parent's" room come on around 6:00am, and the one in the "child's" room about an hour later. This is a pretty good approximation of a morning ritual between a parent and a child. I have both lamps shutting off as daybreak sun turns into morning. This was actually very easy to do. I had never used timers before, but I quickly discovered there are several different types, including very inexpensive manual timers on up to moderately priced digital timers that control 7 different on-off periods. I chose a couple of digital timers right in the middle that would control three separate on-off periods. Digital timers are simple to use, come with very intuitive instructions, and in about ten minutes I had finished setting up the on-off periods for the first lamp. The 2nd lamp took me only a couple of minutes as I didn't have anything new to learn. I feel like my house is much safer than it was a couple of weeks ago. I still arm my ADT monitored security system each night, but I decided there was nothing wrong with simulating more activity in my house than there actually is. Living alone doesn't have to mean becoming an easy target for burglars. Try this in your house, and I think you'll quickly discover the value of this home security tip. The last thing you want to discover at the onset of a house fire is that no one knows what to do. Being unprepared is one of the leading causes of fire-related injuries and deaths. Taking the time to teach your family the basics of fire prevention and other security tips and escape from your house will create an emergency preparedness plan that can directly lead to lives saved in the event you and your family are ever caught in a house fire. The leading cause of residential fires is cooking. In fact, cooking accounts for nearly 30% of all house fires. In many cases, oil has overheated in a hot frying pan. When hot oil grease catches fire many homeowners either panic and do nothing, or do the wrong thing like trying to douse the fire with water. Of course water and oil don't mix, and in turn the water actually causes the oil fire to spread. Place a lid on the pan that is on fire is one of the most effective ways to control the fires. Also, salt, flour, or baking soda will also contain the fire. No kitchen, however, should be without a fire extinguisher. Fire extinguishers are really great for the immediate action required by most small kitchen fires. Knowing how to use a fire extinguisher is one of the first things you will want to teach everyone in your family. They are simple to operate, and even younger children can effectively put out a small kitchen fire if they've been properly trained. Also, the fire extinguisher in your kitchen should be easy to locate, and within reach of anyone in the house who might be expected to use it. Don't place it on a high shelf if younger children have been trained on it and could reasonably be assumed to know how to extinguish a fire. It’s important for you and your family to know how to put out a small fire, because within a few seconds they can actually get out of control. The proper use of a fire extinguisher can save lives and property, but training is the key. If you are not sure how to use one, you can actually purchase an inexpensive extinguisher and use it in your backyard or other open space. You'll get a feel for how powerful it is, how far it will spray, what the chemicals look like upon discharge, and how much time you've got until it's been emptied. Teaching your family what to do in the event of a house fire will ensure that no one panics and people aren't stumbling over each other in their attempt to flee to safety. Additionally, a monitored ADT home security system, complete with smoke detectors, is a great way to protect your home and family against the threat of a house fire. It's one thing to be the victim of a home burglar or other property crime when you've taken measures to protect against such things. It's an entirely different thing to become a home burglary statistic when you've done absolutely nothing to protect your house, your property, and your family. Here are some crime statistics from across the country, provided by the Bureau of Justice Statistics. Hopefully they'll get your attention. More than 66% of all property crimes in the United States take place in or near the home of the household members. This means your home is a very likely target if anyone in your area is casing houses and property to commit a burglary. Why? There are a few primary reasons. First, you have more items of value in your house than you do in your car, your garage, your storage shed, etc. Burglars go where there are things worth stealing. Second, homeowners leave all of those valuables – things like flat-screen televisions, computers, cash, jewelry – horribly unprotected, erroneously thinking that they will never be the victim of a home invasion. Statistically, you're playing with fire if you don't take some measures to protect your home. Last year US households suffered more than 16.3 million property crimes. The Bureau of Justice Statistics estimates, sadly, that just over 55% of all household burglaries aren't even reported to the police. This means the real number could be over 30 million property crimes. We also know, thanks to a study done by Temple University, that homes without a home security system installed are as much as 3 times as likely to be burglarized compared to a home with a professionally installed home security system. What this means is burglars are looking for easy targets. They want to be in and out in a handful of minutes, and if that can't be accomplished because a home security system is getting in their way, they'll move on to an easier target. Every 14.6 seconds a burglar occurs in the United States. If that's not bad enough, the average reported loss is estimated to be in excess of $2,000. Can you really afford to replace two thousand dollars worth of stolen items such as computers, or HD televisions, or expensive cameras, or even cash? That's a large enough amount of money to at least have me on my way to the hardware store to buy some brand new deadbolt locks! If you do nothing about home security, it's only a matter of time before you and your family become a crime statistics that could have been avoided. 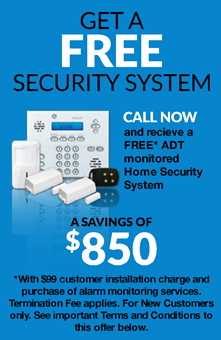 Have a monitored ADT home security system professionally installed in your home and get the 24-hour-per-day protection you and your family deserve.